Eric J. Reinhold is the president of Academy Wealth Management and a graduate of the United States Naval Academy. His passion is to write youth fantasy novels that incorporate strong moral character and biblical values. Eric teaches Sunday school at First Baptist Sweetwater Church in Longwood, Florida, where he attends with his wife, Kim, and three children. Echoes from unseen singers filled the cavernous space inside the United States Naval Academy Chapel. Row after row of precisely aligned dark wood benches were broken up by a single swath of navy blue carpet running the length of the church. The perfectly blended voices seemed to come from everywhere and nowhere in particular. Ryann, who had just celebrated his thirteenth birthday, was drawn into the melodic a cappella song. Goose bumps popped up along his arm in the silence that followed. He felt alone, yet he was one of the hundreds sitting stiffly upright in the ornately fashioned pews. Squirming in the hard seat, he tried to displace the chill running down his back. He peered forward over the unmoving heads packed into the hundreds of rows in front of them. The white shirts with black and gold shoulder boards, identifying the rank of each midshipman, dotted the otherwise drab congregation. Without moving his head, Ryann glanced left down the pew. He had positioned himself perfectly, or so he thought, with his sister, Alison, next to him, followed by his brother, Henry Jr., and then his parents. To his right was an open aisle. As the white-robed pastor strode purposefully from his highback chair to the podium, Ryann’s hand crept along his pant leg with the stealth of a spider. Reaching into his pocket, he pulled out his cell phone, suppressing a smile as he silently congratulated himself on picking out one so small. He was grateful his parents had bought the phone but struggled with the rules that had come with it, like their prohibition against texting in church. The sound of the pastor’s voice launching into the sermon provided the perfect diversion for him to slide the phone down the side of his leg. A quick glance provided the needed confidence to continue, and Ryann’s thumb moved with robotic precision to select his two best friends and then type out a quick message. here in academy chapel. wuu2? Ryann had received the phone as a gift for moving up to seventh grade. Liddy’s and Terell’s parents had quickly followed his parents’ lead, and now the three of them could get in touch with each other at any moment. Being scattered around the country for summer vacations didn’t seem quite so bad when they could quickly share moments with their best friends. Ryann put his father in the category of “techie” and patiently sat through his instructions on all the features of the cell phone, but the real education came from his friends. He was going to be taking his first year of Spanish when classes began, and Ryann figured it would actually be his third language after English and texting. He smiled. Who would have known a month ago that wuu2 meant, “What are you up to?” Sliding the cell phone under his leg to keep it hidden, he shifted in the hard bench and sighed, waiting to see if there would be a response. Liddy’s back pocket buzzed as she followed her parents down the white marble stairs of the grand foyer. She slowly reached around to pull out the hot pink phone as her parents and other tourists listened to the tour director. Liddy rolled her eyes. Cottages? Who are they trying to kid? This is the biggest mansion I’ve ever seen. Flipping open her phone, she read Ryann’s message and quickly responded. Liddy enjoyed the change of scenery as her family took their annual summer vacation to Rhode Island to stay with her grandparents. With the trip winding down, her parents had suggested a day trip to the famous Newport mansions. It sounded boring to Liddy until they mentioned the ocean cliff walk. Two-thirds of the trek was supposed to be fairly easy and scenic, but the last third was described as “treacherous” in the colorful brochure her parents had given her. Seventy-foot drops off the rocky shoreline into the turbulent ocean waves sounded exciting to her. The abrupt silence of the tour guide erased her vision of the future, and Liddy’s thoughts turned to Terell. Her thumbs glided across the black keys, typing out a quick message. Terell jerked in his seat, his elbow jabbing his mother in the ribs. Glancing about, he ran his hands up and down the top of his pants, smoothing them out. His mother’s upturned palm came down on his leg. Busted, Terell thought, pulling his cell phone out of his pocket and handing it to her. Terell watched his mother flip it open so only she could view it. As he looked up into her face she mouthed the word later. He leaned back and tried to focus on the sermon. His mom was pretty consistent about quizzing him about the content later in the day. “Mom! That’s ‘can’t wait to see you,’” Terell breathed exasperatedly while shaking his head. “Yes, ma’am,” he acknowledged while flipping open his cell to get the message. He quickly scanned the text and typed back. Ryann strode hastily down the granite steps outside the chapel doors with Alison trying to keep up. Red brick walkways running parallel to orange and yellow flowerbeds greeted him. The famous Herndon Monument his father always spoke of towered off to the left. The twenty-one-foot, gray-speckled obelisk sprouted out of the ground in stark contrast to the rich green grass and brown oak trees surrounding it. He tried to picture hundreds of sweaty midshipmen scaling the greased monument to replace the plebe “dixie-cup hat” on top with a midshipmen cover. This marked the official end of the difficult first year and an elevation from plebe to midshipman third class. As his father had recounted numerous times, legend held that whoever replaced the dixie cup hat was destined to be the first in his or her class to become an admiral, although in reality it had not yet occurred. “He wants us to check out John Paul Jones’ crypt before we go to lunch,” Henry said, ignoring Ryann’s comment. “What’s a crypt?” Alison asked. “It’s where his bones are buried,” Ryann said, widening his eyes and curling his fingers like monster claws. “Oh, gross!” Alison replied, scrunching up her face and turning away. “Where is it?” Ryann asked. The two boys raced along the narrow sidewalk outlining the left side of the chapel. “Hey, guys! Wait for me,” Alison cried out from behind them. Rushing down the steps, Henry and Ryann slapped the thick wooden doors with open palms, jolting the heavy entrance open. Pushing their way in, they stopped just inside at a sign with old typeface, pointing the way to the crypt. Both boys jumped as the high-pitched yelp echoed around the small foyer entrance. “Shhh,” they whispered in unison, glaring at their sister. “Sorry.” Alison shrugged her shoulders, the light dimming quickly as the bulky doors swung shut with a loud bang. “Do you think it’s open to the public?” Henry whispered. The small room’s walls hung with ornate religious symbols. A large black wooden door beside an altar caught Ryann’s attention, and he rushed to examine it. “Well, Mr. Know-it-all, what next?” Alison asked in her snootiest voice. “We go through the door, of course.” Pushing the door open, Ryann expected to be at their final destination, but instead the door’s echoing groans resounded through a hollow chamber. The catacombs of the chapel basement seemed unending, and the more up-to-date style of this room appeared nothing like a crypt. “Are you both sure John Paul Jones is down here?” Alison continued with indignant pessimism. Another rustic black door with an ancient doorknob awaited them. Henry reached it first. He turned the ornate metal doorknob and pulled back firmly. Ryann glanced over his shoulder and gave Alison a sinister grin, hoping to increase her anxiety. A dimly lit room of swirling black and white marble awaited them. He followed his brother into the room and nearly collided with him when Henry stopped. Pushing him aside, Ryann grinned at the sight. A massive, almost totally black coffin dominated the center of the room. The base, rising out of the white marble floor, was adorned with four dolphins leaping out from each corner. Eight thick swirled-marble columns surrounding the coffin held up an ornately carved, octagon-shaped ceiling. Glowing blue light formed a halo in the recession above the tomb, cascading down eerily over the marble casket of the immortalized John Paul Jones. “Ahh!” Alison cried out. Her voice echoed across the marble floors. Both boys jerked around in Alison’s direction. Standing at attention next to her like a suit of armor was a Marine guard Ryann hadn’t noticed upon entering. His immaculate dress uniform molded to him as if he never took it off, like a painted statue. Ryann scanned up from the dim light reflecting off the soldier’s polished black shoes, past the crisply pressed blue pants with red stripes down each side to his coat-like black top with gleaming gold buttons from neck to waist. His thick white belt with a highly polished Marine Corps emblazoned buckle, white gloved hands and white cover broke up the dark colors that had kept him hidden. He stared into the expressionless face of the guard to see if he could catch him blinking. “Dad, I’ve heard of Davey Jones from that pirate movie, but who’s John Paul Jones?” Henry asked. “Sarco who?” Henry asked, wrinkling up his brow. “Sarcophagus. You know, a receptacle for a corpse carved from stone. As a plebe you have to memorize that type of important information.” Ryann’s father smiled. “Yeah, right.” Henry rolled his eyes. “Okay, gotta go, guys. And this time, let’s go out the right way,” Mr. Watters said as he led them around the room to the exit. Ryann read off the names of the ships etched into the marble as they walked—Providence, Ariel, Ranger, Serapis, Alliance, Alfred—and some other name he couldn’t read as they went out the door. As they walked toward their car, he sent a text to Liddy. just left wicked cool tomb of dead guy under the chapel…zup? I have to admit, I loved Eric's first book in this series Ryann Watters and the Kings Sword. My now 10 yr old son and I read it this past Spring and both enjoyed it. We'd been waiting for book 2 to come out and haven't had a chance to read it together. I plan on reading it this weekend on my own since Jake is gone...again! I will post my review when I'm finished and then hope to get it read with Jake before school starts and I'll have him post a review. His review is my goal. I want him to think more about the book than the words he's reading. This is turning out to be quite the adventure! Ryann, Terell, and Liddy head back to Aeliana. It's not the same this time around. All their friends have passed away, having been gone for 400 years. Drake also has very little time in the story. 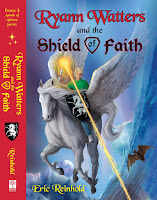 Ryann Watters and the Shield of Faith is an allegory for the life of Jesus. We meet an entirely new cast of characters, aside from Sorcha, who was in book 1. Each of these new characters plays a part in the ministry of Carwyn (Jesus). Throughout the book I was trying to figure out who would betray Carwyn, who would deny him, but I already knew who would sacrifice himself for the others. 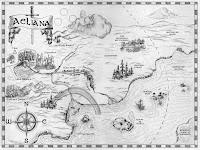 As usual Eric's imagination brings us into another adventure in Aeliana. He brings scripture into this novel in a way that readers, especially kids, will be able to grasp what Jesus said and did. I'm hoping on a personal level that my 10 yr old will be able to put what Carwyn does in this story and understand it as being the same as what Jesus did for all of us. 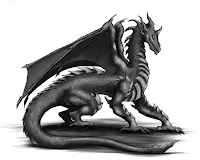 If you'd like to win the 1st book in this series Ryann Watters and the Kings Sword please leave a comment letting me know what kind of imaginary creature you'd be if you were in Eric's novel. I'd have to say I'd probably like to be part of an elven clan. Their litheness and ability with a bow are always portrayed as being so awesome!! As always leave me your email with your comment. If you don't leave a way to contact you, I won't be putting you in the drawing. Sorry. Contest open to US residents only. This will run until August 18th. Thank you for visiting. Sounds like another great book for all four of my boys to read. I am even getting excited reading the first chapter. We would love a chance to enter the drawing. BTW, my oldest just finished Hood and loved it.